- Thank you so much for the many encouraging words in response to my post yesterday! I received so many heartfelt comments and I really appreciate the few emails as well. They were just what my heart needed. - Tony's Grandpa John passed away this week. Unfortunately I did not have the privilege of knowing John prior to his debilitating stroke 20 years ago, but for all intents and purposes he was a wonderful man. He and his wife Stella had 13 children, which resulted in over 120 grand children and great grandchildren. They raised their family to be hard workers and cultivated a family rich in faith. John and Stella were married for over 70 years, with Stella being his caretaker, with additional help in recent years, ever since his stroke. If there was ever a legacy to see and understand without it needing being put into words it's spending just a bit of time in a room filled with this family. 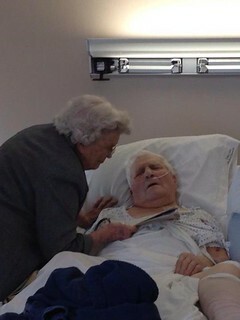 And just because this picture is so poignant, taken at the hospital of Stella continuing their routine of sharing devotions with John. Tony has been asked by his Grandma to read his Grandpa's obituary and I've been praying for strength for Tony since we found out Monday night. - My mini sessions were scheduled for this Saturday and unfortunately, Tony and I knew it would be best if I not attend the funeral. The headache of rescheduling 10 client sessions would prove too great! God however had other plans and it seems the only amount of rain of the season is forecasted for tomorrow . . . the whole live long day. So, I will now be attending the funeral with Tony and his family. Sometimes, things just work out differently than expected. - So, Sunday, half of my mini sessions will be shot around two previously scheduled sessions and the remainder will be made up on the 21st. Unfortunately, as I'm shooting a wedding on the 20th . . . which is my birthday, I will not have any more birthday celebration than Friday evening of the 19th. Wah wah. Welcome to adulthood. - My brother took both of these pictures, while we were over at his house to celebrate his birthday. 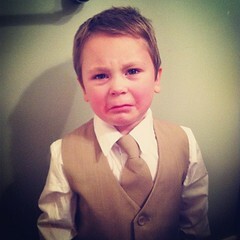 Bethany picked up the suits we purchased for their wedding and I thought it'd be fun to try them on the boys. Clearly, Isaac was not impressed. Ezra on the other hand, after we got it on him, was perfectly find and looked like quite the gentleman. Isaac is quite smitten with Bethany, so I basically forced her to bribe him and tell him just how handsome he looked, otherwise I can just imagine how well the wedding day is going to go! So the bribe is set, after Levi and Bethany are married, Isaac will get to spend the night at their house. I think he'd pretty much do anything to make that happen. - To hopefully ease the angst, we also came up with purchasing John Deere suspenders! Hopefully Isaac will be so happy to wear John Deere that he isn't upset about the suit. I'm thinking I'll also pick him up some John Deere socks and maybe even a little John Deere for his pocket before walking down the aisle? - He has been so difficult with clothes again lately. Every morning he asks, "Can I wear the same clothes as yesterday?" He fully acknowledges they're dirty and just worn, but he doesn't care. The other day when I went to pick him up, I noticed that he was wearing his fleece jacket over his green and grey striped shirt [note, it was a green shirt!]. I asked him if he was cold and he responded that he was, but when we got in the car he said "Mama, I wore my jacket because I didn't want my friends to see my shirt because it's not John Deere." AHHHHHH! How is this starting already? That face! 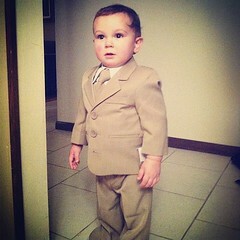 (Isaac in the suit). I love it. Sending my thoughts to you, Tony and Tony's family. How adorable do those boys look in those suits?! Ah, just melt my heart right now! That photo of Tony's grandparents. Wow. I cried at the picture of Tony's grandparents. How incredible. Hugs to you guys this weekend! We have a lot of clothes drama with my 3 year old, too. She prefers to wear outfits once...like as in once for a few hours... and then wants to wear pajamas at various intervals. So there are MULTIPLE changes a day. Plus she insisted on long sleeves and pants all summer and now it's all short sleeves and skirts. SERIOUSLY? Ay yi yi. I'm sorry to hear about Tony's grandpa. Too funny about Isaac and the clothes. Oh, you have such handsome boys!